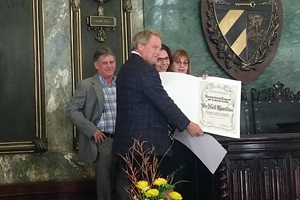 Neil Hamilton, director of the Drake Agricultural Law Center, Dwight D. Opperman Chair of Law, and professor of law at Drake University Law School, was honored at the 11th International Congress on Agrarian Law in Havana, Cuba. Titled “The Right to Adequate Food in Relation to Contemporary Agrarian Law,” the congress welcomed representatives from 15 countries around the world June 26-29. Hamilton provided the opening remarks and received a special career achievement award by the Cuban Agrarian Law Society. The award recognized Hamilton for his valuable contribution to the development of agrarian law and for devoting his life to teaching future generations. Hamilton later presented on the topic of “Feeding Our Future: Reflections on the Changing Role of Law in a Changing Agricultural World.” Two Drake Law alumnae—Kelly Nuckolls, LW’16, and Jennifer Zwagerman, LW’04, associate director of the Drake Agricultural Law Center and director of career development at Drake Law School—were also panelists during the congress. Emiliano Lerda, LW’10, served as an interpreter. This was the eighth trip Hamilton has made to Cuba. In January 2012, he led a delegation of Drake Law students to the country, becoming the first U.S. legal group ever to visit Cuba to study agricultural law. Drake has since sent multiple student groups to Cuba as part of an international agricultural law course. Hamilton also conducted pioneering research with an agricultural law faculty member at the University of Havana Law School. “Agricultural law offers us a common language to help build bridges to a more optimistic future,” Hamilton said. Hamilton has taught agricultural law at Drake Law School for 35 years. In addition to serving as director of the Drake Agricultural Law Center, he advises the Drake Journal of Agricultural Law and oversees Drake’s Food and Agricultural Law Certificate program. As one of the nation’s leading experts in how the law shapes agriculture and the food system, Hamilton has authored dozens of law review articles and lectured throughout the United States and in more than 20 countries. Hamilton served as president of the American Agricultural Law Association, chair of the Agriculture Law Section of the Association of American Law Schools (AALS), and co-chair of the U.S. Department of Agriculture (USDA) Small Farms Advisory Committee. He is also a member of the board of directors for the Iowa National Heritage Foundation and served as chair of the Iowa Food Policy Council. Founded in 1983, the Drake Agricultural Law Center is an internationally recognized program centered on the study of food and agricultural law. The center provides opportunities for students to explore how the legal system impacts the food system and the agricultural sector’s ability to produce, market, and use agricultural products.